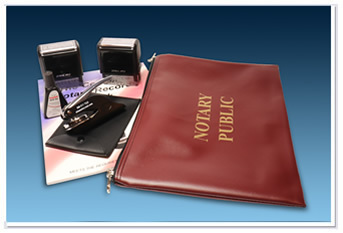 Includes a pocket seal, a leatherette carrying case, the Notary Record Book, a self-inking Affidavit stamp, a Rectangular self-inking Rubber Stamp Seal and a burgundy, zippered case to hold all your notary supplies. Also, an optional combination lock is available in accssories and sold separately for your burgundy, zippered case. AS AN ADDED BONUS YOU ALSO RECEIVE A FREE A26 black stamp ink supply, 6cc size. This ink is especially formulated for self-inking stamps and stamp pads and is free with the purchase of A36.